Hair Color/Style: Sutā has light hair, which is short with backwards spikes. Skin Tone/Build: Pale without much muscle mass, just very toned. Written Description: Sutā has light brown hair which is short with backwards spikes. His hair is naturally soft, even without the use of shampoos. He usually wears his headband in a bandana like feature over his head when he is in his standard Konoha uniform inclusive of a flack jacket. Sutā face has no acne to it, and is very soft and has a mature look to it. His face is somewhat round but has high cheek bones. Sutā's nose is broad and well-defined. His skin is a natural pale. He is slim with a slight muscle mass. When he walks, he walks upright, with a slight attitude behind it. He has no scars anywhere on his body. Sutā's fingers a skinny and straight but his fight are slightly the opposite being kinda chubby and short, leaving out the bony feature of them. Sutā is kinda short of the average guy. When Sutā is on a mission or usually wondering around the village, most of the time he is seen in his standard Konoha uniform inclusive of a flack jacket, but instead of the usual sandles, he wears knee-high black boats and the blue sleaves are cut at the shoulder. 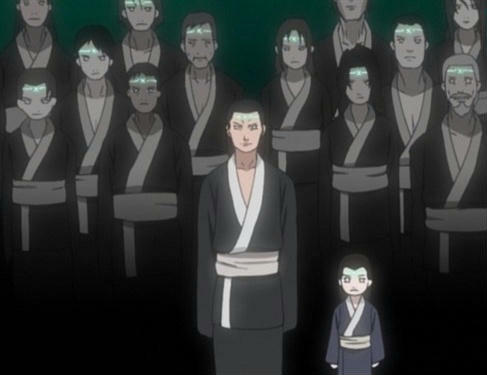 When he is seen in the Hyuga compound, he is usually wearing black robes that have a white trim and a white belt to hold it together. Personality; Sutā is extremely bright, and able to be objectively critical in his analysis. He loves new ideas, and become very excited over abstractions and theories and even music. Sutā loves to discuss these concepts with others. He may seem "dreamy" and distant to others, because he spends a lot of time alone, thinking. He is tolerant and flexible in most situations, unless one of his firmly held beliefs has been challenged. Sutā is a shy person, not well to walk up to someone and just start a conversation. Though, underneath his shyness, he is a very nice person and respects almost anyone. He can handle tough situations but he can sometimes work himself into a corner. Sutā always puts himself down, saying it's his fault if anything bad happens around him. When he is sad, he always puts up a fake smile so he doesn't have to listen people saying, "whats wrong," or, "what happened?" He doesn't like talking to people about his problems, so he just bottles everything up inside of him. He likes to read and write stories, to help relieve is stress. He respects everyone and he gets embarrassed when someone points out something he does "well". Sutā is interested in security and peaceful living. He has a strongly-felt internal sense of duty, which leads him into a serious air and the motivation to follow through on tasks. Sutā is uncomfortable expressing affection and emotion to others. Though he does smile a lot when he is uncomfortable. He has an excellent ability to take any task and define it, organize it, plan it, and implement it through to completion. Under stress, he psychs himself out sees nothing but everything that can go wrong. He will berate himself for things which he should have done differently, or duties which he had failed to perform. He will lose his ability to see things calmly and reasonably, and will depress himself with his visions of doom. While he generally take things very seriously, Luxia also usually has an offbeat sense of humor and can be a lot of fun. Sutā has a difficult time saying "no" when he is given more work than he can handle. For this reason, Sutā may be unwittingly taken advantage of. Sutā could be characterized as brave, although he does not like confrontation, he would give his life for another person just so they could live. Even though he doesn't like to show emotion, Sutā wishes he could find a that special person to spend the rest of his life with. His life long motivation is to find the rest of his clan and restore it to the glory it once had. Major: Easily Manipulated-he easily told what to do. Minor Agoraphobia-he fears being in wide open areas. You now have 2 weeks to finish this, or it will be placed in the archives. 1 week left unless you state you need more time.